Working on my Niching for Hippies course has been a lot of fun. Because there’s a surprising amount to say about niching. It can be a complicated business. But, in another way, it’s often really simple. At the end of the day, the niche that usually clicks with people the most and becomes the most fulfilling, sustainable and profitable is . . . people like you. You have been through a certain journey in your life and you are uniquely qualified to help others make that same journey. This was something I’d noticed over the years but then I met Jeffrey Van Dyk and Suzanne Falter-Barns who helped me see this even more clearly. I wrote about it a lot in my blog post on Wound as Niche. Here are a few thoughts below to get you started . . .
Big Idea #4: Your niche is probably you. But what’s to stop it from being a long and drawn out process of endless dating of potential niches? What if you want a short cut on this? Here’s the short course – your niche is probably people just like you. Here’s a thought to mull on: ‘you deepest wounds are likely the doorway into your truest niche’. The things you’ve most struggled with your entire life are likely the brightest gifts you have to give the world. Tiina Veer is a client of mine who is an amazing example of the power of proper niching in action. Instead of trying to make her yoga class appeal to everyone – she chose a very particular niche. People who don’t look like Barbie Dolls. And she created ‘Yoga for Round Bodies’. There are a whole community of people with round bodies who might feel intimidated to go to a typical yoga class. But, with Tiina, they find an incredibly safe and supportive space. Lisa Mitchell saw how burdened therapists like her were with holding other people’s secrets. So she created an entirely anonymous online forum where therapists could share what they were experiencing and get anonymous support from other therapists around the world. If you went through depression you might be the perfect person to help others through that. I spent my early years in business learning a high pressure and manipulative approach to selling. 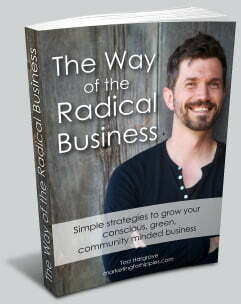 Now I teach hippies how to market and sell in a way that applies no pressure. I’m the perfect person to do this. I went through it and got out. The same is almost certainly true for you. And you’ll get some support in exploring the wound/niche connection for yourself. For more information or to sign up for the Niching for Hippies six week coaching program click here.